Friday Night Flicks: Stay Local! For such a small and quiet town, we sure do have a lot going on ALL THE TIME! This Friday night and next we have two movies hitting the stage in The Chev. 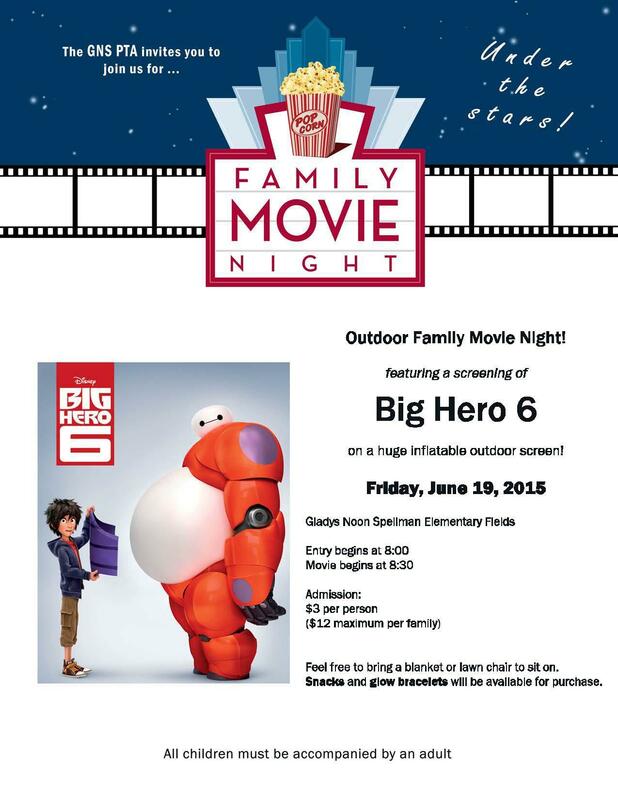 On Friday (June 19th) our local elementary school PTA is showing an outdoor movie as a way to raise funds for the school. So kids or no kids, make it a date night and head on over to Spellman to enjoy Big Hero 6. Gates open at 8, movie will begin at 8:30. Admission is a mere $3 per person or $12 for your entire family. Snacks, drinks and glow bracelets will be available as well. The following Friday on June 26th will be the makeup date for the Star Wars evening at the pool. Unfortunately the event was rained out so fingers crossed for good weather! More information can be found here. I applaud my community for allowing me and my family to stay local. Have you heard about this slow parenting idea? I hate that we have to have so many terms for parenting, but that’s another story. Cheverly has allowed me to slow parent- I have been trying to do this for the last years and it is exactly why I encourage people to move to our great community. No need to drive to either of these movie nights. In fact, there has been no need for my nanny to drive my kids anywhere outside of Cheverly. Last week we had swim lessons at the Cheverly Pool, this week my son is taking Spanish classes at the Cheverly United Methodist Church, next week we have soccer camp at Town Park…and then of course, there is VBS in July. I couldn’t be more grateful for these close activities and safe environments for my children. -Houses are selling quickly. In fact, even before a Cheverly listing had an open house this weekend, it was snatched up. That is a great sign for our housing market. I’m so glad others are hearing about our lovely hood. -I have renewed my love affair with Aldi. Last week I looked for their red signs for discounted foods and found my gluten free products were on sale. These red sign sales are simply unreal. I bought my favorite lentil/edamame chips for $0.99 per bag. Ahhh…aldi. I just love you! -I Choose Cheverly has an Instagram account in which I’m featuring lots of fun town photos. Check it out here. -We Choose Wednesdays will air tomorrow! So excited for what is to come. Previous Post I Was A Loner Until…VBS!